If we have several people wanting the same program on the same day, we therefore automatically take you all together (with a maximum of 8 people) and apply the cheaper price. However some of you prefer to be alone with the guide and we ask you to state this when you make your reservation - or in any case AT LEAST A WEEK BEFORE you arrive in Wadi Rum. We make an extra charge of 10JD/person per day for this. During the high season the service may not be available or the charge may be doubled. We do realise that this charge is high, but so many people are asking for this service that we are running short of good guides. We should like to make it quite clear that if you do not arrange specifically for a private trip, it is entirely possible that you will find yourself with others on your tour to a maximum number of 8 people. Private tours are "private" during the day. Most of the time there will be other guests at the camp for supper, the overnight and breakfast. But there are plenty of places to be private around our camp. So don't be afraid that you will find yourself in a package tour group! However, one important information: If you cannot arrive in time for our usual morning departure, that is to say comfortably before 9.30 am, we need to charge you for a private tour. This means that the private tour surcharge would be added to the normal charge for that day. 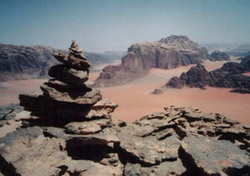 There are a number of possibilities to explore Wadi Rum. Look for our one day tours, two day programs and three and more day programs. You can find our general information about our tours here.